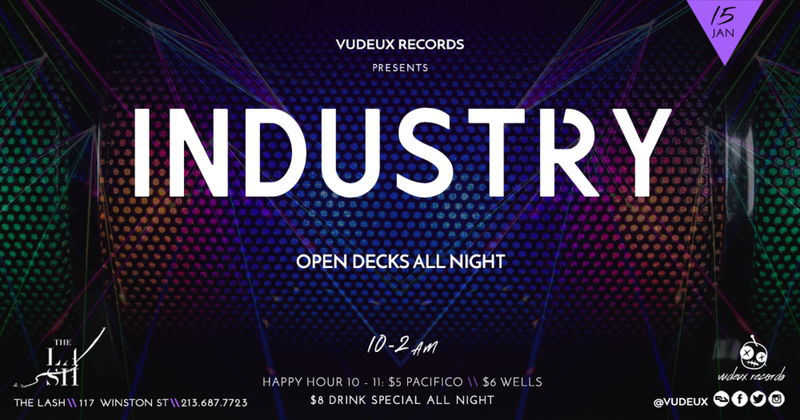 Vudeux Records is an underground dance music imprint with deep roots in the Los Angeles and San Francisco dance communities. Headed and A&Rd by veteran producer and sound selector, Mickie Hendrix, Vudeux is set on a course for long standing legitimacy as a respected publisher of underground sounds. With artists signed around the world and a growing roster of new talent seeking to make their mark, Vudeux is dedicated to providing an outlet for the other 90%(ish) of music that goes unheard by most dance music lovers. The Lash is a concept club, bar, performance and social space located in the historic core of downtown Los Angeles and Hollywood. Off a hidden Downtown alleyway, this minimalist bar is quickly becoming the new place to be. Upon entering, you'll notice smashed subway tiles splatter the walls and a constant buzz of favorite local musicians and DJs. Forget fancy cocktails, this concept club/bar/performance space offers no nonsense drinks. 21+ MUST HAVE VALID I.D.